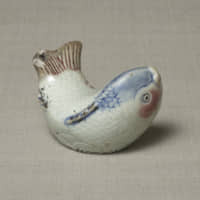 The exhibition “Joseon White Porcelains,” curated by The Japan Folk Crafts Museum, showcases 150 works of ritual and everyday porcelain of Korea’s Joseon dynasty (1392-1910) from the museum’s collection, which is one of the largest in Japan from this period. 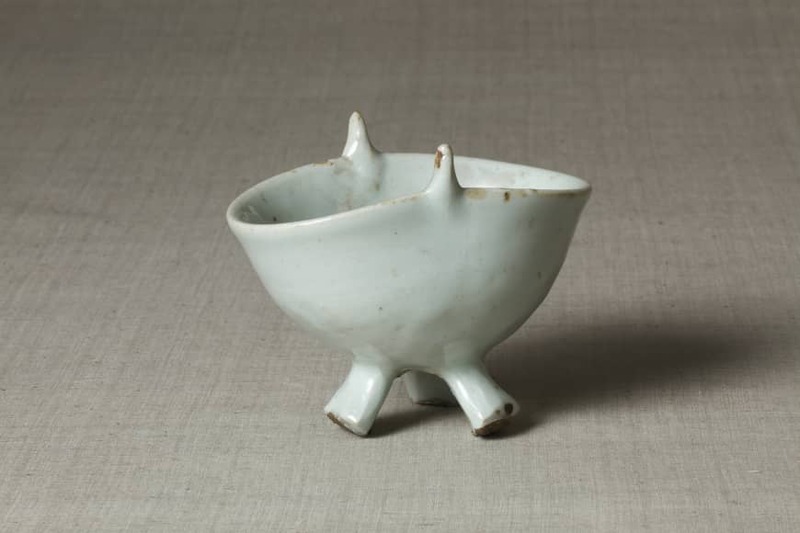 White porcelain was first introduced from China to Korea in the 10th century, and from the early 15th century it was used to make ritual vessels based on the shapes and stylistic motifs of Chinese bronze ritual vessels. In reworking the styles into porcelain, Korean artisans simplified the designs, reimagining them as streamlined objects without ornamentation. On display at the exhibition is one particularly striking example of such vessels: a 19th-century creamy white three-legged wine cup. Its form, rough surface and monochromatic use of color enhance its beauty. Confucianism, the ideology of Korea’s Joseon dynasty, promulgated respect for authority figures with an ethical code that reinforced hierarchy through rituals and ritualistic practices. Ancestors were an integral part of the family and worshipped as protectors of family welfare. Formal Confucian rituals to honor a family’s ancestors involved setting up altars with up to 40 or 50 vessels, including incense burners, flower vases, wine cups, and plates and platters with offerings of fruit and rice cakes. Wealthier families constructed memorial shrines to ancestors with elaborate altars packed with offerings. Commoners, meanwhile, had simpler table arrangements, or displayed affordable paintings of typical Confucian family altars as stand-ins, such as one of a 19th-century-style family altar on show at the museum. White porcelain also featured in the study spaces of affluent Korean “scholar-officials,” who were both intellectuals and bureaucrats and took pride in the sophisticated design of these rooms, embellishing them with folding screens, writing desks and calligraphy utensils. Two exhibited scholars’ tables, with displays of various white porcelain water droppers for diluting calligraphy ink, evoke the mood of the Joseon dynasty scholar’s study. Water droppers were especially favored by the literati given their symbolic representation of strength. 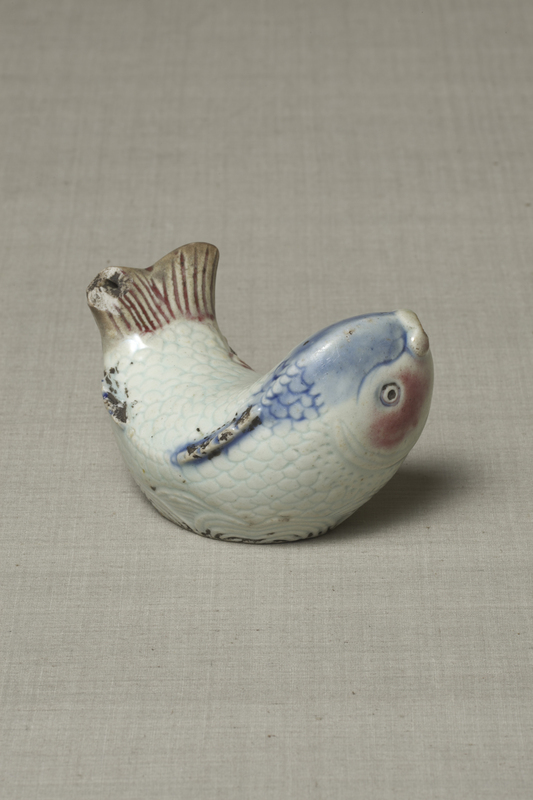 A beautiful late 19th-century carp-shaped porcelain one at the museum, for example, is decorated with a subtle underglaze of cobalt blue and copper red, and shows the carp with an open mouth, twisted body and an upturned tail as if it were leaping upstream. According to legend, carp were possessed with the agility and power to swim up waterfalls and transform into dragons, symbolizing a scholar’s aspirations for auspicious events in his life. 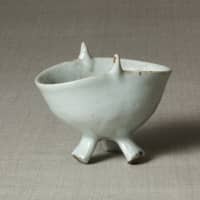 The items selected for this exhibition speak volumes about the stunning simplicity behind Korean aesthetics and the iconography of Confucian rituals. Once you’ve seen the selected pieces on display, you’ll likely never look at white porcelain in quite the same way.